Bladder cancer is a malignant tumor occurs in the bladder mucosa and it is commonly seen in the urinary system. There are about 150,000 patients died of bladder cancer every year throughout the world, among which, the incidence of men is 3 to 4 times higher than women and it usually occurs in people during the age of 40 to 70 years old. Painless bloody urine is the most commonly seen symptom of bladder cancer, almost all the patients show this symptom when they are diagnosed with bladder cancer. If patients can notice this signal and take timely examination, they can achieve early detection, early diagnosis and early treatment. 1.Bloody urine: Bloody urine is usually caused by the ulceration and bleeding of the tumor. The blood volume of which varies, we can see it by naked eyes if it is in a large volume, while it can only be observed with some red blood cells in the urine under the microscope if it is in small amount. Bloody urine of bladder cancer patients has two characteristics: first, it is painless, namely, patients can’t feel any pain or discomforts when it occures, which is called painless hematuria medically; secondly, it happens intermittently, that is to say, bloody urine may stop automatically or relieve. The interval of hematuria’s occurring can be several days or months, or even half a year. 2.Stimulus symptoms of the bladder: when the tumor is occurring in the bladder trigone or when the scope of the tumor’s pathological changes and co-infections is increasing, it will stimulate the bladder and make the patients occur to frequent and urgent urination. 3.Urinary tract obstructions: tumor with big size, tumors in the bladder neck or blood clots blocking will all cause urinary difficulty or even urine retention. 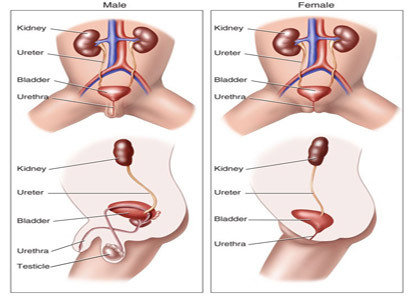 Patients will emerge to waist pain, hydronephrosis or damage of the kidney function if the tumor has infiltrated to the ureteral orifice and causing obstruction in the urinary tract. 4.Metastatic symptoms: when advanced stage cancer is infiltrating to the surrounding tissues and organs of the bladder or emerging to pelvic lymph node metastasis, it will lead to bladder pain, urethral or vaginal fistula and lower limb edema; when distant metastasis appeared, patients will occur to organ function damage, bone pain and Cachexia. Above are the common symptoms of bladder cancer. Experts from Modern Cancer Hospital Guangzhou remind that if anyone emerges to the above symptoms, he should go to a regular hospital for checkup as soon as possible.